Hydronic radiant heating is a proven method for warming your home or for snow melting applications. 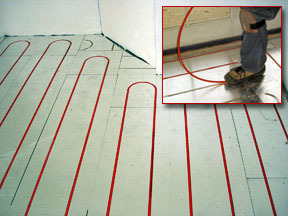 Hydronic floor heating systems utilize specially treated water that is heated and circulated in tubing under the floor (or in cement or asphalt for snow melting systems). A boiler heats the liquid which is then pumped through special PEX tubing that is installed under the floor. The heated water produces warmth that radiates across the floor's surface. The materials, techniques and technology of hydronic radiant heat systems have dramatically improved in recent years. Hydronic floor heating systems utilize PEX tubing that is installed in a concrete mass called Gypsum Concrete or "Gypcrete." This method works very well in most applications, but the development of a low-mass or modular board underlayment system (RauPanel™) has made hydronic systems easier to install for certain situations (pictured below). Rather than embedding the hot water tubing in concrete, the PEX tubing is laid in the grooves of pre-cut wood panels. The floor heating system is ideal for remodeling as well as most new construction projects. For remodeling projects or to reduce the weight and height concerns of traditional Gypcrete applications, the modular InfloorBoards are an excellent solution. 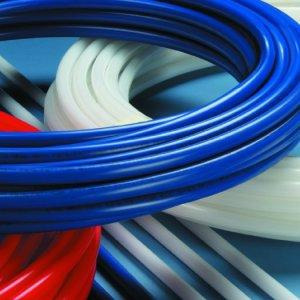 These panels eliminate the mess and hassle of adding concrete to your home, and puts the PEX tubing is in its proper spacing and pattern. After the boards and tubing are installed, you can add hardwood, carpet, tile and other floor-coverings directly on top. While electric heated floors are generally recommended over hydronic systems, there is still a place for hydronic floor heating and snow melting applications. Hydronic (liquid-based) systems can operate at a slightly lower cost because the systems (boiler) can run on gas, which may be less expensive than local electricity rates. So the systems use little electricity, which can be a benefit for homes off the power grid or in areas with high electricity prices. Because the operational cost can be slightly less than that of electric radiant heating systems, hydronic radiant heat is often used for large commercial radiant heat applications.